MEXICO CITY – I’m now writing this from Mexico City, my next step along this particular foray into the open mic world … or the world of the open mic… or the world of F1…. In any case, before I move on to talking about doing open mics in Mexico City, I want to just put the final touches to the visit to Austin, Texas. Monday night, my last night there, I managed to let loose and make up for all the lost time on the first night there: I performed at B.D. Riley’s on 6th Street, then dropped over to the Speakeasy, just around the corner, but found the usual open mic there had been moved to Ten Oaks, around the corner from that; then finished off at the famous, “Stompin Grounds” on South Congress. But I’m running way ahead of myself here. The visit to B.D. Riley’s confirmed my feeling about this mainstay open mic in Austin: It is a lot of fun to play in front of the open window looking out onto the sidewalk on 6th Street and seeing if you can attract passersby into the bar. As far as trying to attract the attention of the pub crowd itself, well, it’s hit or miss. B.D. Riley’s is a massive pub that has a large section in the back behind the bar where people tend to go to eat a meal. But it also has tables, bar and chairs in the front of the pub, where people go usually to drink, carouse, maybe listen to music, maybe eat, maybe contemplate life. There was a lot of all of that going on while I played, No. 5 on the list, and not really sure how well my sound was reaching the rest of the establishment. But the temporary fill-in host, Jake, did a great job, and I was really pleased and flattered to be asked to do a fourth song, since it had been three songs up to then. I was surprised a lot because at one point, in my frustration at feeling that I wasn’t reaching people – for one reason or another – I decided just to enjoy the situation, the location, the unique moment, and I turned my back to the audience on my second song and looked up into the sky and out into the street, almost playing IN the street, out that huge front window that borders the stage. Anyway, from there I moved on quickly – after my fish and chips and Kilkenny meal – to the Speakeasy, which is located just around the corner, on Congress, down the street, and where I had noticed earlier in the day that there is an open mic every Monday at 8 pm. But when I got there, I found a private group of tourists or something heading into the place and I asked the concierge if there was an open mic. 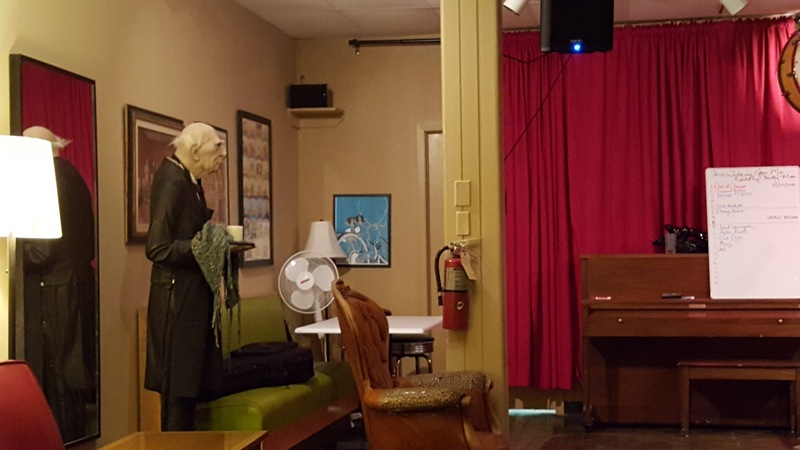 So off I went to Ten Oaks, to discover that I had already played in an open mic at this bar either last year or the year before – and had not put it on my open mic guide list, because I was just too lazy to update and then forgot! – and that it was the same MC. The guy recognized me too, in fact, and said he is a subscriber to this blog. He said that he used to run the open mic there, but had dropped the work and was now just filling in since it was not running at the Ten Oaks. It was already 9:30 at night, and he had a list of at least eight people, and he was only just setting up. So I was worried about my timing, and the possibility of getting on to do the Stompin Grounds open mic. 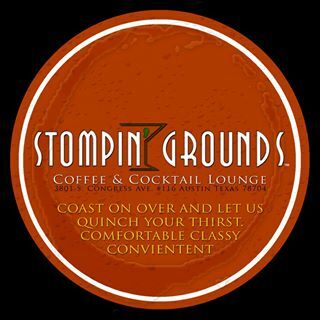 So I told him that, and he suggested that I must NOT miss the Stompin Grounds, and he decided to send a text message to his friend, Raoul, who runs the Stompin Grounds open mic, to get my name on the list! This was such amazing service, such a great way to feel welcome in the Austin music scene. I took a video of one of the musicians setting up at the Ten Oaks, and then I moved on to the Stompin Grounds by taxi. When I got there, the place was just full of musicians, someone was playing, and the feel was one of the best I’d had all week in terms of a turnout at an open mic, and in terms of the quality, the vibe, the youthful enthusiasm… the hipness of the place, the presentation by Raoul… everything was just so RIGHT at the Stompin Grounds. So, yes, there were actually two people who remained for my second song: The guy due up after me, and the girl who had performed just before me. She may have seen that I was watching and listening to her closely, and taking videos, and maybe she felt the need to support me. Or maybe it was because she found it a better place to stay to send messages on her phone. Not sure why. I stopped singing my song for a moment and told her she was welcome to leave the room like everyone else, but I’m not sure she understood…. But what I realized when I looked back at my report about this place last time I played, is that now I can confirm that Stompin Grounds may be one of the coolest, hippest places to play in Austin, but if you don’t bring your fans, get ready for feeling pretty alone…. Of course, maybe I just sang and played total crap. But that’s not the way it felt. Anyway, so ends my week in Austin, and I’m now also going to update and add a link here to my Thumbnail Guide to Austin Open Mics, Jam Sessions and Other Live Music. PS: My internet connection at my hotel in Mexico City is too slow to upload the videos I took on my last night in Austin. So those will have to wait until I get a faster connection. Keep posted. 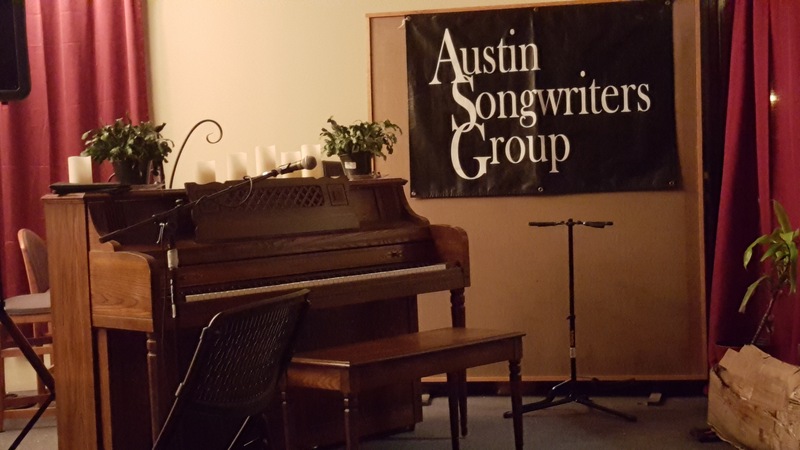 AUSTIN, Texas – I’ve tried on at least two previous occasions to make my way to the Austin Songwriters Group Friday night open mic and song circle, but never made it. Got lost one year and just didn’t find it. It’s located near a McDonald’s off the highway outside Austin near the airport. It is located in its own permanent headquarters, in the Mockingbird Café, next to a catfish restaurant. It has existed for decades. And it is absolutely super cool, and last night I had an experience like none before in open mics – which seems pretty rare today for me…. The group has seminars, songwriting workshops and other events. And Friday night is the open night where you can show up with your guitar and take part in the open mic and the song circle afterwards. The open mic has a format that I have never seen before, but which is apparently used in several other venues in Austin. What happens is that the musicians that take part sing two songs, but they go up on stage in groups of three or four, sitting down in front of three or four mics, and each musician sings a song before it passes on to the next musician, going through the line twice. After the open mic the group pulled together the chairs into a circle and I was told it was time for the song circle. What is that? Well, a little bit like a bluegrass circle, but in this case it is not bluegrass. Everyone gathered in a circle and one after the other people sang their songs, and the rest of the circle joined in playing lead or whatever, joining in a kind of jam. A fabulous, organized idea. Unfortunately, I had not eaten a meal after going directly from the racetrack to the open mic, and so I decided to leave after they played a few songs. It was horribly difficult, as the circle might go on most of the night, I was told. But after all, I am in Austin to do another job. In any case, it was a refreshing, cool, different slant on the open mic and jam. But what else would you expect from the Austin Songwriters Group? 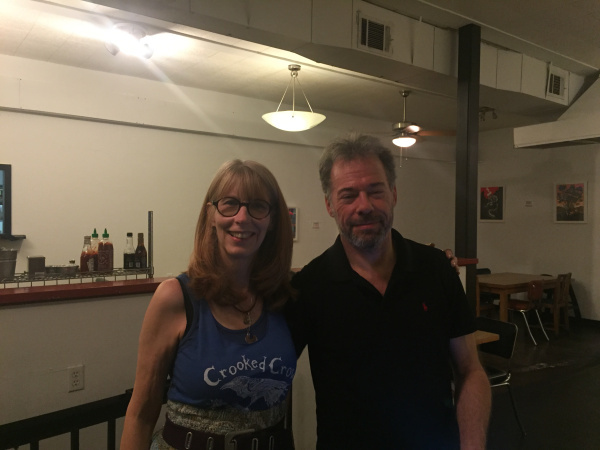 AUSTIN, Texas – My faith in Austin’s open mic scene has been reignited. Not that I really lost faith, I just got frustrated on my first night to find no open mics running at the three venues I visited. There were likely many others elsewhere. But last night, it was a bona fide Austin feel that I found at the open mic at Tom’s Tabooley café on Guadeloupe at 29th Street. Run by Christy Moore – not to be confused with Christy Moore, the Irish singer – this open mic is the logical extension of the now defunct Flipnotics open mic where I met Christie a few years ago. It is singer-songwriter based, with the emphasis on original songs rather than covers. But everything is welcome. I was a little late getting there so I got up ninth on the list. And although I had a chance to move up higher as someone else wanted a later start, I chose to keep ninth in order to watch the other acts in comfort and also to eat my dinner. That’s another cool thing: The café food part is in a separate room, and you can order food to eat, and pop over to the liquor store next door to pick up a few beers or something else. First at Tom’s Tabooley open mic in Austin. I had a great falafel, hummus and a salad. And I had some beer named after a famous local singer. Can’t remember the name. But speaking of local singers, there were a number of cover songs sound by local musicians, including the El Paso-based Tom Russell, whose stuff I quite enjoy. And that was the tone of the evening. They may not have known it – because they live here – but the feel of this place was pure Austin, Texas. Second at Tom’s Tabooley open mic in Austin. I’ll go back – if I get the chance again, and if it continues on…. Third at Tom’s Tabooley open mic in Austin. Fourth at Tom’s Tabooley open mic in Austin. Fifth at Tom’s Tabooley open mic in Austin. Sixth at Tom’s Tabooley open mic in Austin. Seventh at Tom’s Tabooley open mic in Austin. Eight at Tom’s Tabooley open mic in Austin.